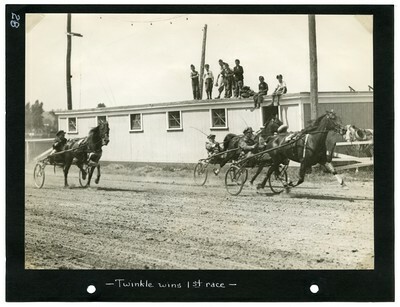 Black and white finish line action photo of the bay mare, Twinkle winning the first race of the Wednesday, July 15, 1936, Maine State Fair Summer Race Meet at the State Fair Grounds, Lewiston, Maine. Placing in second was Calumet Brady, Dennison up. Miss Wooster, Safford up, showed in third. Note the gathering of children on the observation deck in the background.